So anybody else got a bit more Christmas present shopping left to do? I’ve stockpiled a few gifts already, but I’ve still got a few more to get. Some of the things I plan to pick up are on the list below. 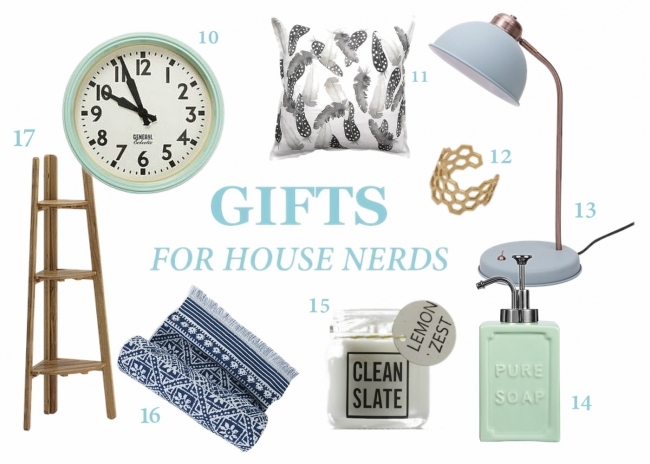 For those stuck for present inspiration, I’ve put together more than 30 of my favourite products and present ideas for Christmas. When I’m considering a present, I always look at something I’m considering buying and think, “Would I like to receive this?” I think it’s a big indicator of a successful gift if you can say an emphatic yes. (Although of course there are exceptions, ie: the book on motorbikes I got for the husband). 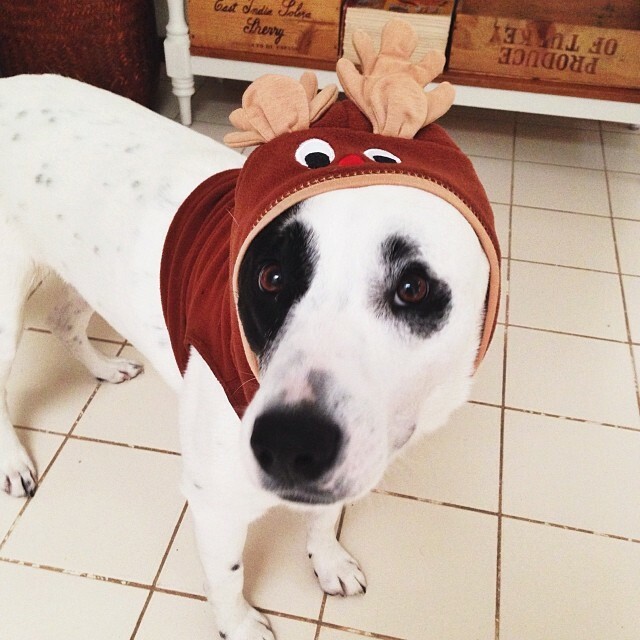 You too can get into the Christmas spirit, just like Nala. In any case, I would be VERY happy to receive any of these things from Santa this year! 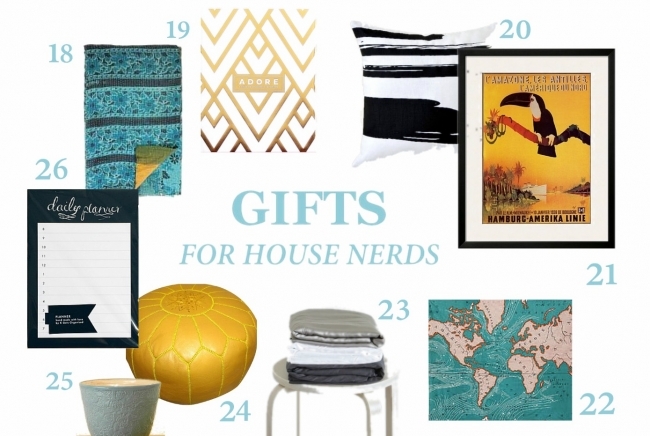 They’re all presents that are perfect for House Nerds. (And because we shouldn’t exclude the small people, especially now that we are going to be having one ourself, I’ve included a few presents for kids too). Happy shopping. These Australian-made products are gorgeous. I love their little house shelf – perfect for a kid’s room so they can display things and decorate it as they like. Ok, so some kids might look dumbfounded if you gave them such a gift, but I as a child loved pretty boxes and containers and organising my stuff (this may be why I had about two childhood friends). Give the nerd kid in your life three of these cute wire storage baskets. I have some at home and there is no end to their usefulness! They come in orange, blue and grey – although I think they would also look so cute spray-painted yellow or mint. Damn these Tiny Fawn paper montage animal prints on Etsy are cute. Even for grown up houses. Enough said. The Phoebe lamp comes in all different patterns, including this cute Kaleidoscope print – but the glorious thing about this lamp is that you can change the A3-sized decorative paper surround whenever you like. 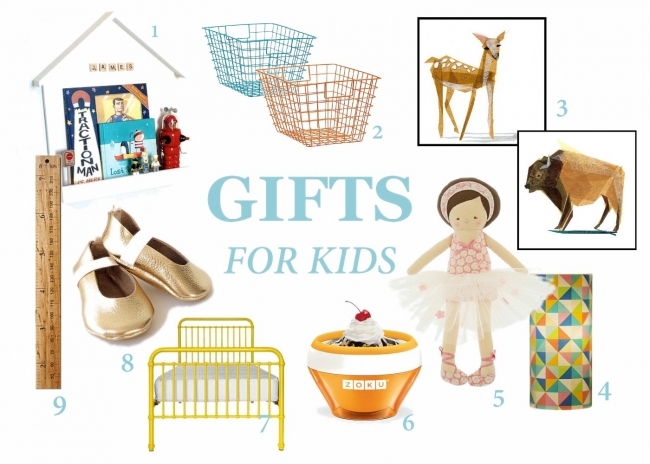 You can re-wrap it in anything from wrapping paper to fabric to an old map to kids’ artwork. Cool huh? Pretty, cuddly and she knows how to wear a tutu. Heaven was the night I tasted homemade salted caramel and peanut butter icecream at a friend’s house. The only thing that has ever put me off getting my own icecream maker has been the cost – and the thought of trying to cram another appliance into our tiny kitchen. Here is the perfect solution – the budget-friendly Zoku Icecream Maker! You just freeze the little inner bowl, add your own icecream recipe mixture and ten minutes later it’s ready – and a perfect individual serving size. So fun and a great gift for grown-up kids too. I always wanted a metal bed when I was little. Well number one bed I wanted was a water bed, but when that got a firm ‘no’ from parents I decided I wanted a cool old-style metal bed. Incy Interiors founder Kristy Withers started her business after a long search to find her son Oscar’s first ‘big boy bed’ – something that looked good, too. Now Incy Interiors do gorgeous kids’ beds, homewares and linens and their Mae bed is gorgeous – they have numerous kids’ beds in all different colours and styles. Hubble and Duke was started by three Freo mums, Jo, Katie and Rosie over coffee and the noise of their combined eight children as they played on the playground on iconic Hubble Street in East Fremantle. Now they are famous for their cute children’s wear all designed and handmade locally, including these Ballet Moccs – made from 100% buttery-soft leather and perfect for wannabe ballerina newborns, toddlers and walkers (the non-scary kind). It is a bit of a not-really-that-funny ‘joke’ in my family that I stopped growing taller even before I reached my teens, (as it turned out, I reached my grand height at the age of 11). When I was 12, my parents bought me an expensive, oversized bike, thinking it made sense financially as I would grow into it. I didn’t grow another millimetre. I am now 29 and I still ride that damn bike that is STILL too big for me. But being ruthlessly mocked about my height by the tall people in my family still wouldn’t stop me from measuring myself on this awesome height chart if I had one. Each is unique and made from recycled Australian hardwoods from the old 1944 Smorgon Steelworks Factory in Brooklyn, Victoria. Would love one in Future Nerd’s room. We got given one of these vintage-style General Eclectic school clocks for our wedding (in blue) and we absolutely love it (thank you Rachel, Ryan, Sam, but mostly Rachel ;) ) We always get visitors asking where we got it from – you can get them at Corner Store (who have a lovely range of clocks in general). Different colours available. Click to see the full collection of great Christmas gifts. An interior stylist and designer, my friend Emma Grace Hawtrey is one talented woman. Inspired by her love of nature, she recently launched her own range of luxury textiles, with each cushion designed and handmade here in WA on 100% linen of the best quality. They are ones to keep forever. My lovely friend Kaylie is the founder of Paper Crab, a small business that sources the most beautiful (and ahead-of-the-curve) ethical products. I LOVE this Honeycomb Ring. I love wider rings – they look so modern and they’re so flattering. Made of hypoallergenic brass which makes it perfect for those with sensitive skin, this beautiful Honeycomb Ring blends modern laser cutting techniques with a timeless (and on-trend) hexagonal honeycomb pattern. I always love getting a really functional gift because every time you use it you’re reminded of the person who gave it to you. I love the colour, shape and the price of this cute lamp. I would love it for my craft room... if anyone's wondering. Ok this would look super-cute in our main bathroom. I love the colour and the old-style look. Clean Slate is a gorgeous range of all-natural vegan candles, soap and skincare all handmade by local Perth girl Kat at her studio in MANY 6160 - and every single one of her soy candles smells good enough to eat. I have one of her pocket-sized vanilla mini candle in our dining room – I haven’t even lit it yet and yet you can detect the delicious scent all throughout the day. I love these candles! My fave scents – peach, lychee & black tea, vanilla and coconut & lime. I recently bought this in teal from David Jones and I love it. It’s pretty, patterned and absolutely huge – all musts for a good beach towel. IKEA has some really great products in this summer's outdoor range – and they’re so affordable. I love the Askholmen plant stand – perfect packed full of pots of herbs for a small balcony or courtyard by the barbecue. Nat sells the most beautiful tribal-inspired, exotic and vintage textiles, homewares and furniture under her business Bowerhouse. Their stuff is incredible – and their beautiful kantha quilts sell out quickly so get in fast. 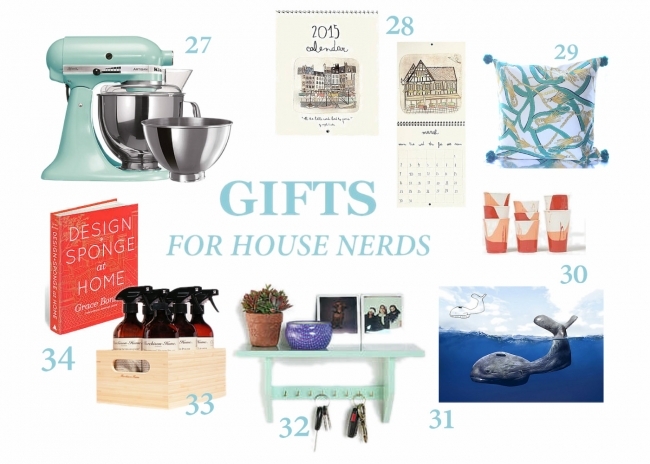 I love Adore Home magazine – it’s gorgeously curated, freely available online and has the most inspiring ideas. I also love giving books for presents and this is an awesome one. It’s full of Adore Home’s signature bold, inspiring ideas that will get you out of your style rut and embracing colour, pattern and interior design ideas across a whole range of price points. Based in Sydney, my clever sister-in-law Olivia designs her own fabric and makes her own beautiful bed linens under her boutique range Moochie Lou. I love the graphic black and white print of her handmade Hamelin cushion, available in two sizes. I happen to know this toucan is winging its way over to me right about now, courtesy Santa (Mr Nerd). It will look so perfect against the dark grey walls in our living room! I love vintage posters and love this print. Goddammit I love Urban Outfitters. Totally appeals to my inner hipster. This world map tapestry shows the flow of the world’s oceans – very interesting, but I just love the colours. Hang it on the wall, or it would make an excellent picnic rug, summer bedspread or tablecloth. Recently Mr Nerd and I (and er, Nala) upgraded our bed linen… to pure luxury, 100% bamboo sheets from Perth-based Mulberry Threads Co. OH MY GOD. These incredible sheets make you feel like you are sleeping in a hotel, every night. So much softer and more luxurious than Egyptian cotton or anything else. And they come in a lovely range of classic beautiful colours. I would so love one of these for our lounge. They make a room look so cosy and inviting. Note that they are delivered unstuffed for cheaper shipping – you simply fill it yourself with old towels or stuffing. Patricia Fernandes is not only one of the funniest people I have met, she is a damn fine ceramic artist too. My blue Meek Beaker (“Your Patricia Fernandes collection all starts with a Meek Beaker,” I remember other friends telling me sagely) is on constant display in our kitchen. Her handmade ceramics are just way too pretty to tuck away. Make 2015 your most organised year yet. My clever friend Kelsie is one of those people you look at and wonder how the hell they manage to do everything. Under her range K Gets Organised, she designs her own stationery and it’s super-cute – and all printed and packaged right here in Perth and affordable too. I love all her stuff but especially her new Chalkboard Daily Planner – it will get your day started and organised from 8am to 7pm. Everyone I have ever met who owns a Kitchenaid swears I HAVE to get one and it will change my life and make cooking effortless. They come in gorgeous colours to suit any and every kitchen. Say the name ‘Magali Dincher’ and chances are there’ll be cries of “I love Magali Dincher.” Because who doesn’t? French-born but now based out of her studio in Perth (lucky for us), Magali recently designed a set of 12 prints inspired by her recent travels to her birth country – and these feature on her gorgeous new 2015 calendar. A sweet gift for your mum or your bestie. If you are after an exotic-looking gift, try t’kozi – an online store based here in Perth selling textiles, homewares and jewellery. T’kozi founder Zona Mir designs the products which are made by artisans in her native Pakistan. “Born in Pakista myself, I'd love for people to know there is so much depth and colour to the culture that people have no idea about,” she told me. I really like the cute ‘Hania’ cushion. Handmade in Fremantle by WA artist Dale Frances, Mad Harriet http://madharriet.com.au/ is a really pretty range of functional porcelain pieces. I love all her things, but how fun are these beakers? There is something about them – maybe it is the colours - that brings to mind memories of finger painting in kindergarten and arts and crafts lessons in school. I think they are gorgeous. I LOVE Dutch muralist Telmo Pieper’s work – particularly his Kiddie Art series. The 25-year-old artist found some old childhood drawings from when he was four, and decided to ‘bring them to life’ by recreating the pictures with Photoshop to make them look as realistic as possible. You have to see more of them but here is one of my faves – his disproportionate whale. I would very much appreciate one of these in my life, because Mr Nerd seems physically incapable of finding keys when they are in the key bowl, despite them staring him in the face. This cute shelf keeps them all neatly hung up – or you can use it for jewellery. It comes in three colours too - mint, coral and cream. I heart Murchison Hume. They’re the nicest people who sell the nicest all-natural household and cleaning products. A box of MH – like this bamboo caddy of six of their top products - makes a gorgeous gift. It’s not saying, ‘your house is dirty’. It’s saying, ‘damn you have fine taste and you deserve only the best most beautiful products in your lovely home’. I love the pretty branding of these products so much – they look so nice you’ll never tuck them away in your cupboards. And bonus, the products smell good enough to drink (don’t). I was given a copy of this amazing interior design book years ago by a sweet friend who knows me very well. Straightaway this book became one of my all-time favourite go-to gift to give to people myself. It is just so good. Based on the incredible Design*Sponge blog, it is seriously one of the most inspiring interior design reads you’ll come across if you love interiors that are vintage, DIY, cosy, thrifted and a little worn around the edges. This book will get you up off your couch and prettifying your home and/or scouring the streets for cute vergeside finds. I have to keep this short but I cannot say anything else except I LOVE THIS BOOK. Get one for anyone you know who’s decorating a place or just bought their first house - or self-gift a copy to yourself. Love it. Few things on here I'd really like for myself!